This is a playlist I created for The Record Stache readers and I included 35 astonishing tunes from various genres! 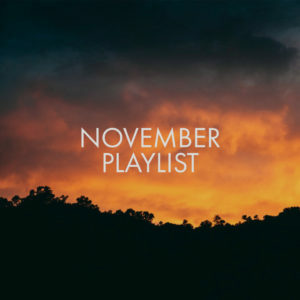 November’s playlist spins some blazing sonic bullets featuring: Bestial Mouths, Wonderdead, Love Hate Affair, Ah! Kosmos, Remi Parson, Paradox Obscur, Bewitched As Dark, Road 377, Dark Buddha Rising, Beauty In Chaos, HOLYGRAM, Musta Paraati, PILES, Polly Panic, New Death, ΟΔΟΣ 55, Vlimmer, FEHM, LAND LINE, A Ritual Sea, Lost Chocolate Lab, New Neon, GRANDEUR, Evan Jewett, The Callas With Lee Ranaldo, Ari Mason, Marva Von Theo, Whispering Sons, We Are Parasols, K Michelle Dubois, Noctorum, On The Wane, Lucky+Love, Equinox, Metal Disco.